Blood of Christ falling upon the earth in the Agony. Have mercy on us. 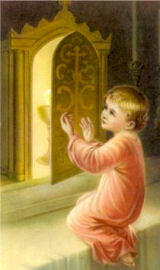 The month of July (Overview - Calendar) is dedicated to the Precious Blood. The feast of the Precious Blood of our Lord was instituted in 1849 by Pius IX, but the devotion is as old as Christianity. The early Fathers say that the Church was born from the pierced side of Christ, and that the sacraments were brought forth through His Blood. In a vision the prophet Isaias saw a man treading out grapes (in the Orient, trampling upon grapes in the wine-press was the usual means of extracting the juice). The prophet asked the man: "Why are your garments so red? 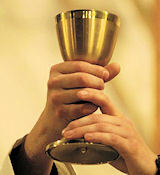 "The wine-press I have trodden alone," he answers, "because from the nations there is no one with me." 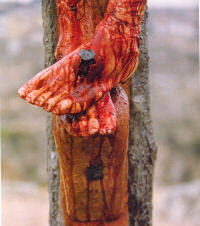 The trodder of the wine-press is Christ, His garments crimsoned by the Blood of redemption. 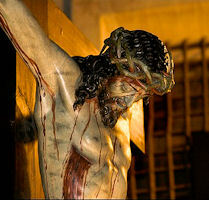 The Church reminds us of the first drops of blood that flowed for our redemption on the day when Jesus was circumcised. It is night on Mount Olivet, and the moon is shining. We see the holy face crimsoned with blood during the agony in the garden. Unhappy, despairing Judas casts the blood-money down in the temple. "I have betrayed innocent blood!" In the scourging chamber we see the Lord in deepest humiliation; under raw strokes the divine Blood spurts out over the floor. Christ is led before Pilate. Pilate shows the blood-covered Body to the crowds: Ecce homo! We go through Jerusalem's streets following the bloody footsteps to Golgotha. Down the beams of the Cross blood trickles. A soldier opens the sacred side. Water and Blood. Adam is sleeping an ecstatic sleep. God opens his side, removes a rib and forms Eve, the mother of all the living. But our view transcends this action and in spirit we behold the second, the divine Adam, Christ. He is sleeping the sleep of death. From His opened side blood and water flow, symbols of baptism and the Eucharist, symbols of the second Eve, the Church, the Mother of all the living. Through blood and water Christ willed to redeem God's many children and to lead them to an eternal home. 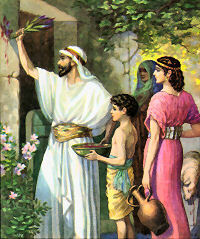 At Jerusalem a service in Yahweh's honor is taking place on the Day of Atonement. The high priest is making his annual entrance into the holy of holies to sprinkle the blood of bucks and bulls upon the covenant in expiation for the sins of the people. The Church shows us the higher meaning of this rite. Our divine High Priest Christ on the first Good Friday entered that Holy of Holies which is not made with hands nor sprinkled with the blood of bucks and bulls; there He effects, once and for all, with His own Blood man's eternal redemption. A finale. Holy Church transports us to the end. The heavenly liturgy is in progress. 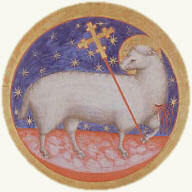 Upon the altar is the Lamb, slain yet alive, crimsoned by His own Blood. Round about stand the countless army of the redeemed in garments washed white in the Blood of the Lamb. Hosts of the blessed are singing the new canticle of redemption: "You have redeemed us out of every tribe and tongue and nation by Your Blood." Now from vision to present reality. How fortunate we are to have divine Blood so near to us, to offer it to the heavenly Father for the sins of the whole world!